More great news from Japan. Re-Ment will be releasing Terrarium figure set Vol. 3 on July 9, 2018. 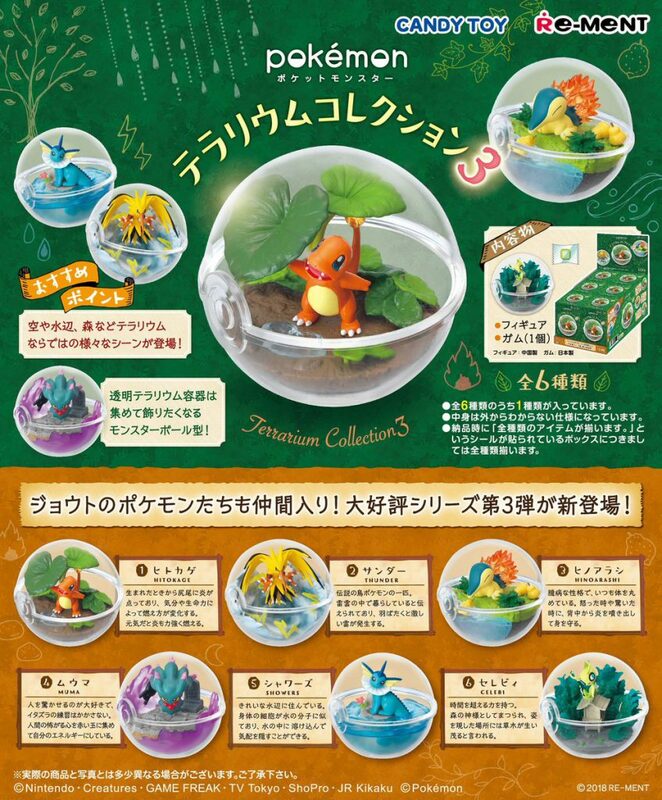 Terrarium figures come in a clear plastic Pokeball shaped capsule with a figure inside, just like a mini terrarium. Vol. 1 featured Pikachu, Dragonair, Eevee, Snorlax, Lapras & Bulbasaur. Vol. 2 featured Pikachu/Togepi, Squirtle, Charizard, Psyduck/Poliwag, Cubone/Sandshrew and Articuno. Vol. 3 will feature Charmander, Zapdos, Cyndaquil, Misdreavus, Vaporeon & Celebi. Vol. 1 & 2 are currently available on Pokevault. Vol. 3 will be available on July 9, 2018, as soon as they are released!